The controversial remark by Vijay Yadav came after the Mughalsarai legislator called the BSP chief a "blot on womankind" for joining hands with the same party that had targeted her at a Lucknow guest house in 1995. BJP legislator Sadhana Singh had used offensive terms against Mayawati at a recent rally. 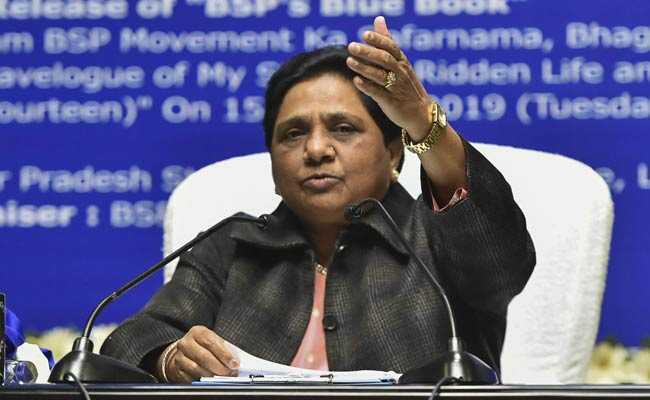 Even as politicians cutting across party lines condemned BJP legislator Sadhana Singh's offensive remarks against Bahujan Samaj Party (BSP) chief Mayawati for joining forces with former rival Samajwadi Party, a supporter of the Dalit leader went a step further on Monday. He declared that he wouldn't be averse to offering a ransom of Rs 50 lakh to whoever beheads Ms Singh. "We will launch protests if Sadhana Singh does not apologise to Behenji (Mayawati) and other women of this country. After collecting money from my supporters, I will give Rs 50 lakh to the person who will bring her head to me," news agency ANI quoted Vijay Yadav, a former BSP legislator, as saying. The controversial remark by Mr Yadav came after the Mughalsarai legislator called the BSP chief a "blot on womankind" for joining hands with the same party that had targeted her at a Lucknow guest house in 1995. "Mayawati sold her dignity for power and joined hands with those who disrespected her... She is a blot on womankind. Cannot say if she can be counted among men or women, she is worse than a transgender person," she had said at a rally on Saturday. While BSP leader SC Misra tweeted that "BJP leaders have lost their mental balance after the BSP-Samajwadi Party alliance", Union Minister Ramdas Athawale said such personal comments should not be made. A BSP leader lodged a complaint against Ms Singh at the Baburi police station. Immediately afterwards, the BJP legislator responded with a clarification that she did not intend to insult anybody. "I just wanted to remind Mayawati about the help extended to her by BJP leaders in 1995," she added. Samajwadi Party leaders had attacked Mayawati and her supporters at the Meerabai Guest House in Lucknow on June 2, 1995, soon after she withdrew support to the Mulayam Singh Yadav government. However, the two parties mended bridges after the emergence of Akhilesh Yadav as the Samajwadi Party chief and will now be fighting the Lok Sabha polls against the BJP together.